Place chicken, bay leaves and peppercorns into a large pot, cover with cold water and bring to the boil. In a bowl mix together eggs, yolks, milk, nutmeg, herbed and season. Lightly spray a bowl that fits onto the pot with the chicken with spray oil, add egg mixture, place onto pot and cover with a lid. Steam egg mixture for about 20 minutes or until set. Set aside to cool, once cold, remove from bowl and cut into cubes or use a star cookie cutter. Simmer chicken until tender, take out of the stock and set aside to cool. Wash, peel and dice the vegetables. In a saucepan heat the oil, sauté the vegetables lightly without colour. Add chicken stock through a strainer and simmer until vegetables are tender. 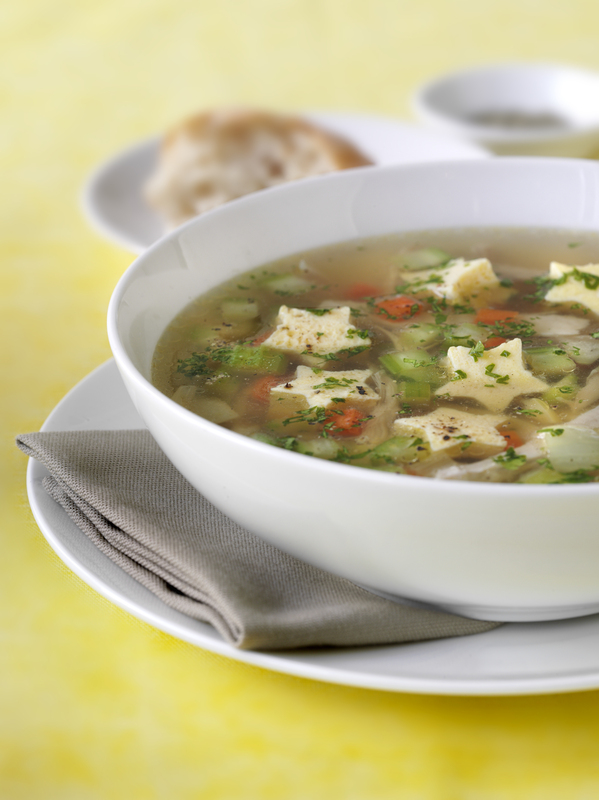 Take chicken and cut into bite size chunks, place back into the stock and vegetables. Add egg mixture pieces and serve.